Photons are discrete, particle-like units of electromagnetic radiation, more commonly known as light. Unlike particles of matter, however, photons have no mass. It is surprising, then, to find that gravity—traditionally understood as the force attracting any two objects with mass—can affect light. One such instance occurs when light is trapped within the gravitational field of a black hole. It is also possible to create “artificial gravity” that affects light. Recent research has shown that the properties of photons can be altered inside the atomic structure of solids, giving these photons an effective mass and causing them to behave in much the same way as a ball thrown in the air. These altered photons are known as polaritons. 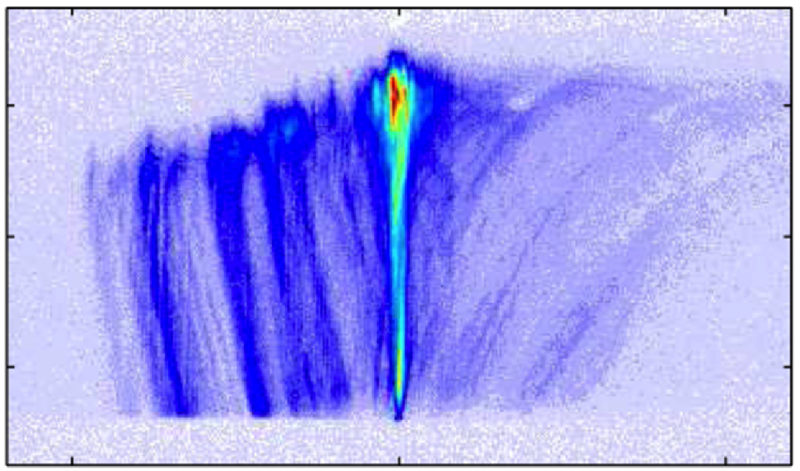 At the University of Pittsburgh, we have used short laser pulses to inject light into a semiconducting material. We then use a “streak” camera, which can resolve motion on time scales of trillionths of seconds, to track the photons’ motion. Fig. 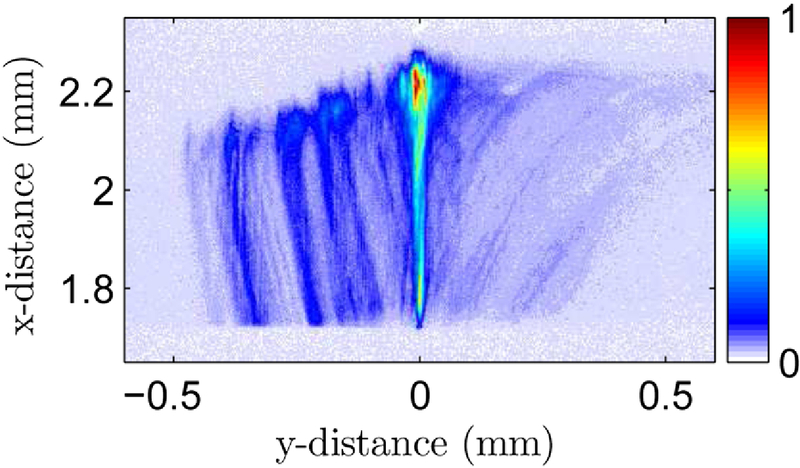 1 shows the trajectory of the polariton “pulse” produced as it travels through the semiconductor, and Fig. 2 shows the distance of the polaritons from the injection point as a function of time. The dashed red line in this image is a parabola, which is the same behavior predicted for a ball tossed in the air, as shown in Fig. 3. Once the photons observed here entered the atomic structure of the semiconductor, their motion can be described with the same laws that describe the ball’s motion. Both slow down as they move in one direction, come to a momentary stop, and then “fall” back the other direction. Effectively, the light behaves as an object with mass does under the influence of gravity, gaining potential energy as it slows down, which is transformed back into kinetic energy as it reverses direction and speeds up. This behavior of photons can also be called “slow reflection,” since the light turns around and moves in the opposite direction—in this kind of reflection, however, there is no surface the light is bouncing off! Besides improving our understanding of properties of light that are difficult to observe directly, studying polaritons allows us to manipulate light’s behavior, including its speed and direction. So-called “slow light,” of which slow reflection is one example, has potential applications in telecommunications and quantum computing technologies. Fig. 1 (Click to enlarge) Fig. 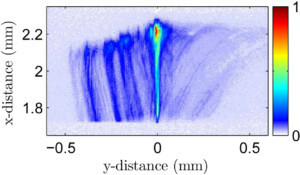 1 The trajectory of the polariton pulse as it travels through the semiconductor. Brighter colors represent more intense light. 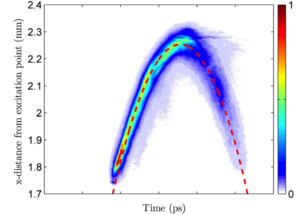 The main trajectory is the central, straight one at y=0, with a very bright spot (red) where the pulse spends more time as it slows and turns around. The side (dark blue) trajectories are the paths of stray light scattered out from the main pulse. Fig. 2 (Click to enlarge) Fig. 2 The distance of the polaritons from the injection point as a function of time. These modified photons decelerate as they move away from the injection point, then stop, reverse direction, and accelerate back toward the injection point. Fig. 3 (Click to enlarge) Fig. 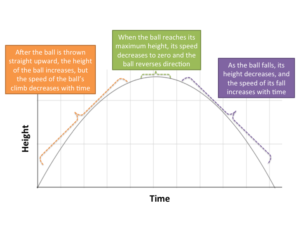 3 The height of a ball thrown straight upward as a function of time. This parabolic relationship, typical of a mass acted on by the constant force of gravity, is also observed in photons inside a solid-state atomic structure, as shown in Fig. 2.